I worked a for few years at Wal-Mart, and it’s very weird to shop there when you have worked there yourself. With only one exception, I can tell that the cashier doesn’t want to be there any more than I wanted to. I think we all know that jobs that can be done by machines are usually done by machines, and I believe that cashiering is a job just waiting to be filled by a robot. 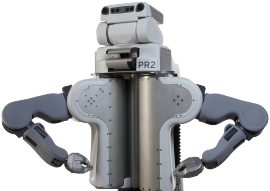 The robot is here with the PR2 personal robot from Willow Garage. The robot is an open source job, and a group of researchers at Stanford’s AI Lab has made it into a checker and bag boy. You can watch a video of it after the jump so you can see it for yourself. This autonomous checkout clerk can grab an item, then scan it, and put it in the bag where it belongs. You will note that it doesn’t always do the scan right the first time, and it can only drop it in the bag. As a former checker, I know the importance of arranging items in a grocery bag. You don’t want to put a six-pack on a carton of eggs, for example. I’m not certain how well this robot could do that, and check out the death grip on that Dr. Pepper! Also, you will note that the video has to be sped up just so it looks like a regular bag boy. However, it doesn’t move any faster than someone on the self checkout. Yeah, this technology has a long way to go. However, I can see this being the future once it has been perfected. If your goal is to speed things up, it seems like the wrong thing to automate, considering they have a long way to go just to match the speed and dexterity (and logic) of a human cashier or the self checkout. Even if every checkout lane was open 24/7 staffed with a robot, people would get annoyed at having to wait on the slow robot. Whatever happened to that idea of a scanner that you push the cart through that reads all the RFIDs in the cart simultaneously instead of sequential scanning? If someone had an overflowing cart of groceries, that would be a REAL time saver.